1981 Chevy C10- James S.
This truck was purchased August 17, 1981, from Newton Chevrolet in Chattanooga, Tennessee, by a man who lived in Harrison, Tennessee. He died just a couple of years later, and the truck remained parked in a garage for seven (7) years, until his daughter got married. His daughter and son-in-law drove the truck, and put approximately 58,000 miles on it until 2001. During those years, the engine was damaged and replaced with a 350 engine, complete with aluminum heads, headers, aluminum intake, and Edelbrock carburetor. In October 2001, the son-in-law was in Lansing, Michigan with the truck, working to construct a new GM assembly plant. Apparently, things were not going well with their marriage, and his wife told him he had to sell her dad’s truck. 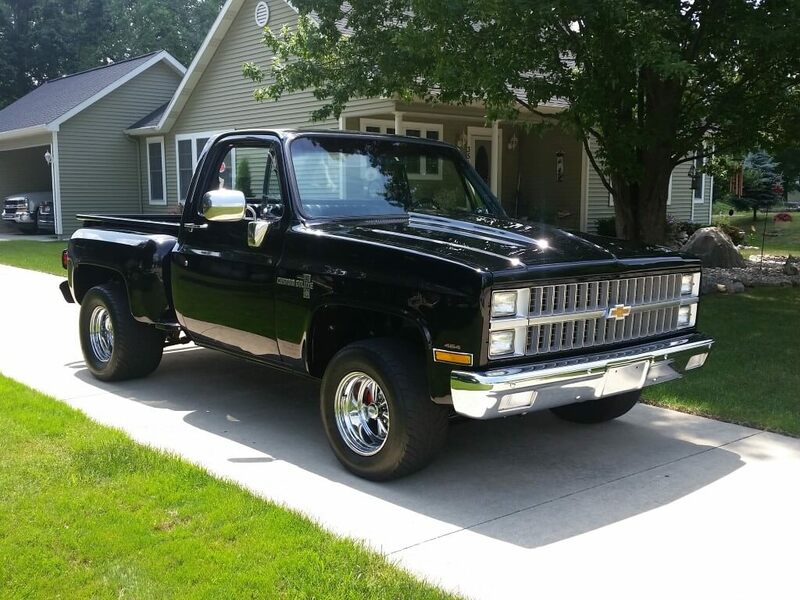 I happened to see the truck with a “For Sale” sign, and it appeared to be in excellent condition, so I stopped, looked at it, and purchased it for $5400.00. After taking it home, I garaged it until the following spring, and drove it a few miles through the summer of 2002. I installed a three (3) inch body lift kit, and put 33 inch tires on it during that summer, and my daughter helped me replace the rotted wood bed with new oak boards. The differential was also upgraded to 4:10 gears with positraction. In February 2003, a friend and I drove the truck, with a double flatbed trailer in tow, to Wisconsin, to pick up two (2) Corvettes I had purchased. The load was actually too heavy, and on the way back, the engine blew a head gasket just before reaching home on the return trip. This began another two (2) year stint parking in a garage. Part of the Corvette purchases included a used 454 engine, which I decided to completely rebuild, to replace the damaged 350 engine in the truck. I also had a heavy duty 700R4 overdrive transmission built, and included that with the engine swap. In the spring of 2004, I began driving the truck, and showed it at a few car shows. It ran great, and showed okay. 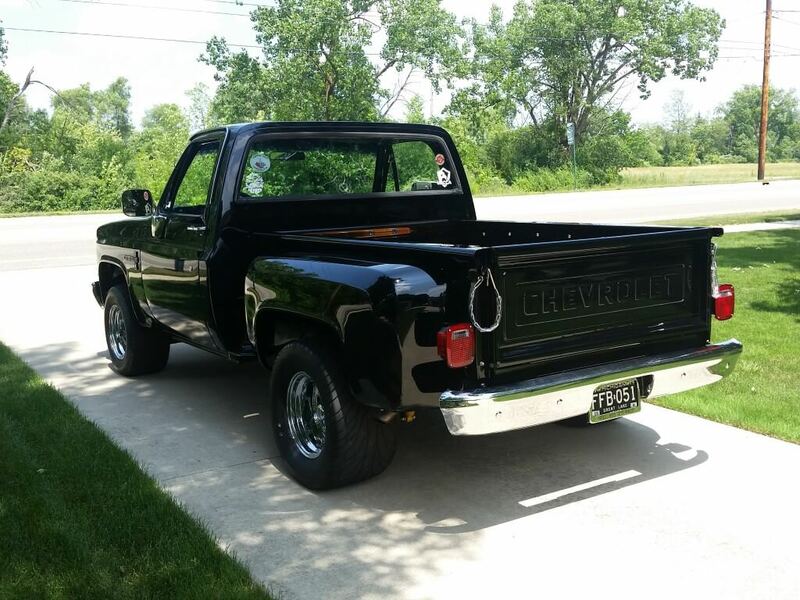 Although it had no rust what so ever, the paint was showing it’s age, and the truck really deserved to be restored. I now decided to do a full frame off restoration. The truck was completely dismantled, and would be in the process of restoration for the next eleven (11) years. The frame was sandblasted, painted with POR-15 rust inhibitor, and finished with two (2) finish coats of gloss black, The body, fenders, pickup box panels, and new cowl induction hood were stripped and painted, including two (2) base coats, and four (4) clear coats. The interior is lined with sound and heat insulation mat, and new carpet installed. Dakota digital gauges were installed, mainly to provide a tachometer, and a speedometer that registered more than the original 85 miles per hour. 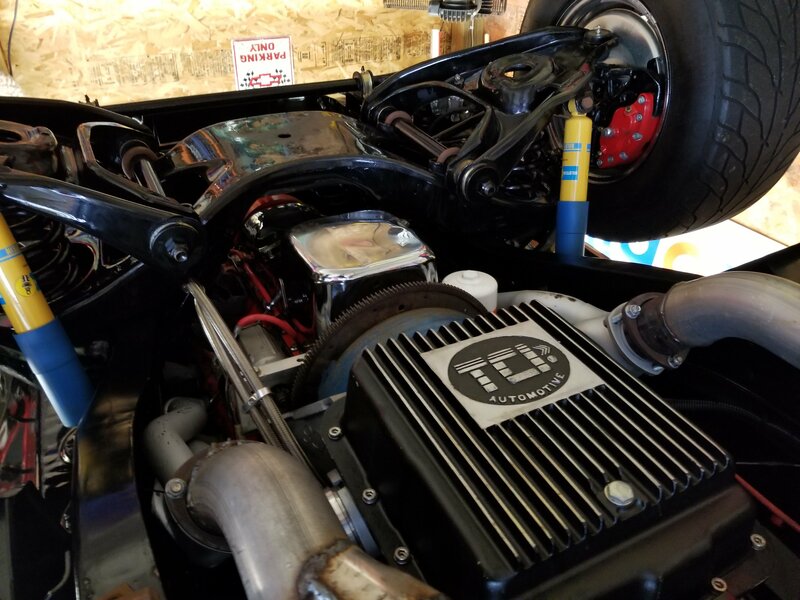 The 454 engine was upgraded to FiTech dual-quad fuel injection, hydro boost power brakes installed, rack and pinion steering installed, and CVF Racing serpentine belt drive kit installed. The factory air conditioning was retained, but updated with a Sanden style polished compressor with 134a refrigerant. Front brake calipers are Wilwood aluminum replacements, with cross drilled and slotted rotors. Cragar 15×10 SST wheels, and Mickey Thompson Sportsman S/R tires, 29×12.00 front, 29×15.00 rear, were mounted. The side saddle 16-gallon tank was replaced with a 19-gallon aluminum fuel cell between the frame rails in back, with an in-tank electric fuel pump for the fuel injection. I love this truck, and plan to drive the truck regularly during the summer months, sometimes pulling a RV trailer. Also look forward participating in car/truck shows, and have plans to join others in the Hot Rod Magazine Power Tour, Old US 127 Tour in Michigan, and the Fantom Works Route 66 Tour.